Mouth-watering, tasty chicken flavour your feline friend craves. TEMPTATIONS® Indoor Tasty Chicken is rated5.0 out of5 by5. Rated 5 out of5 byMisterE fromCat loves these!I adopted a 7 or 8 ye old cat a month ago and it was really great to discover how much he loves these. I really love showing him how special he is by giving him his favourit treat! Glad it is a healthy snack! Rated 5 out of5 byShy78 fromCatchingI buy temptations on a regular basis and my cats love all of the flavors. But this one is definitely the favorite out of them all. They can't get to me fast enough when I shake they bag! Rated 5 out of5 byAshtonBrooke fromMy cats favourite treatsI love temptations, and I especially love the indoor cat treats! They are priced great, and my cats just love them! They cannot get enough! Rated 5 out of5 byLisa50 fromMany optionsI but these all thevtime my cats just love them.Just shake the bag and they come. CHICKEN BY-PRODUCT MEAL, GROUND CORN, ANIMAL FAT (PRESERVED WITH MIXED TOCOPHEROLS), BREWERS RICE, DRIED MEAT BY-PRODUCTS, WHEAT FLOUR, NATURAL FLAVOUR, CELLULOSE, CORN GLUTEN MEAL, DRIED BEET PULP, POTASSIUM CHLORIDE, CHOLINE CHLORIDE, SALT, L-CARNITINE, MINERALS (ZINC SULFATE, COPPER SULFATE, MANGANESE SULFATE, POTASSIUM IODIDE), TAURINE, DL-METHIONINE, CALCIUM CARBONATE, YUCCA SCHIDIGERA EXTRACT, VITAMINS (ALPHA TOCOPHEROL ACETATE [SOURCE OF VITAMIN E], VITAMIN A ACETATE, NIACIN SUPPLEMENT, VITAMIN B12 SUPPLEMENT, RIBOFLAVIN SUPPLEMENT, THIAMINE MONONITRATE, D-CALCIUM PANTOTHENATE, VITAMIN D3 SUPPLEMENT, BIOTIN, PYRIDOXINE HYDROCHLORIDE [VITAMIN B6], FOLIC ACID). 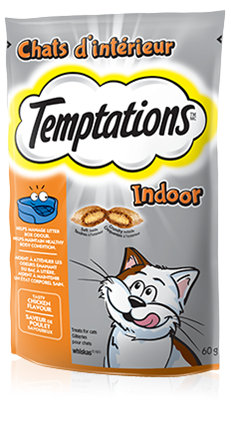 TEMPTATIONS® Indoor Tasty Chicken Treat is formulated to meet the nutritional levels established by the AAFCO Cat Food Nutrient Profiles for adult maintenance.